Introducing SecureShot "Yard Guard". Our new line of covert, weatherproof digital video recorders designed to protect outdoor assets and property. 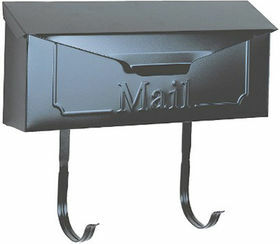 This is a working wall mounted mail box with a key lock. Featuring a letter slot when top is flipped up and a newspaper holder on bottom. With our exclusive copyrighted micro PIR motion activation system, there is virtually no battery drain while on standby, and no false alarms. As soon as "body heat" is detected, up to 30 feet away, hi resolution (640 X 480) video is recorded on a hidden SD card. Recording continues until 1 minute after motion ceases, then unit automatically returns to standby mode. Rechargeable high capacity Li-ion battery offers 1 year of standby operation and over 20 hours of actual recording per charge. Recordings can be played back to TV/VCR directly from unit, or SD card can be removed and played on your PC with included USB SD card reader.